So, I am now almost 27 weeks, almost the start of my third trimester. 13 more weeks to go! 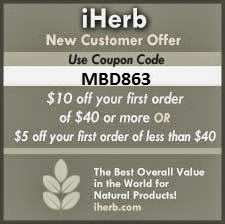 I have researched and find out prices for almost everything that is recommended for babies. From breast pumps to bath tubs to nasal aspirators. I guess it's in my genes to look for something good, yet reasonably priced. Is it worth the extra $$? Is second hand items good enough? Prefolds or all-in-ones? It was in the plans that we will get a camp cot instead of the traditional wooden cot after much research. Reason is that it's easy to pack, and the cost is also so much more reasonable, at around ZAR1k each. 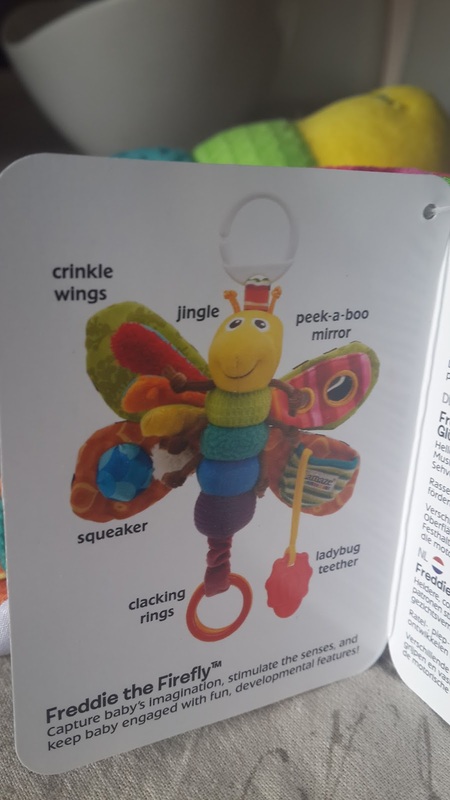 It usually comes with changing surface, mobile hanging over cot and useful pockets. However, a friend of ours has been so kind to offer us their wooden cot and it looks so beautiful. So we decided to use that for now to see how it goes. I'm sure it will be wonderful. We have decided to not get a travel system, and will get a car seat on its own. I will also be doing baby carrying on carriers. That is the plan for now, at least we can decide if it's feasible when baby comes than to rush to get a whole bulky travel system. 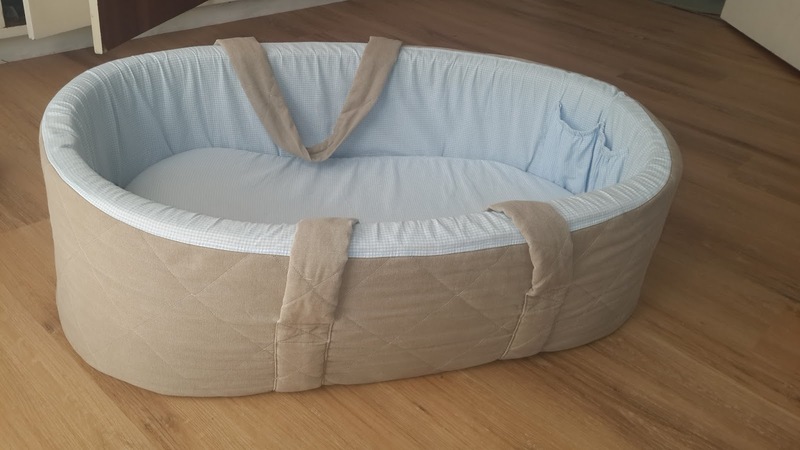 Without a pram, this carry cot will be useful when we bring baby to friend's houses, especially when baby is born in summer there will be more outings. However, must carry cots available in the market (Graco, Chicco, Chellino, etc) are very small in size. I think they can only fit for only 1 month! We looked further and found only a few boutique brands like Treehouse sells these big ones. It is almost the width of the wooden cot. 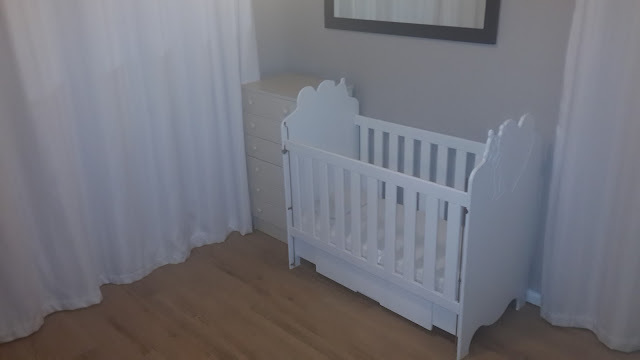 I will also be putting baby to sleep in this carry cot, placed in the wooden cot for the first few months. He should fit until at least 3-4 months. We bought this second hand through Gumtree. It is stil in very good condition, and we got it for R250. The retail price for the same-sized carry cot is ZAR800-900. I am determined to breast feed my baby, so this to me, is one of the essentials of breastfeeding. As we do not have any comfortable chair in the house, I think it will also help a lot to get into a comfortable position for me and baby. 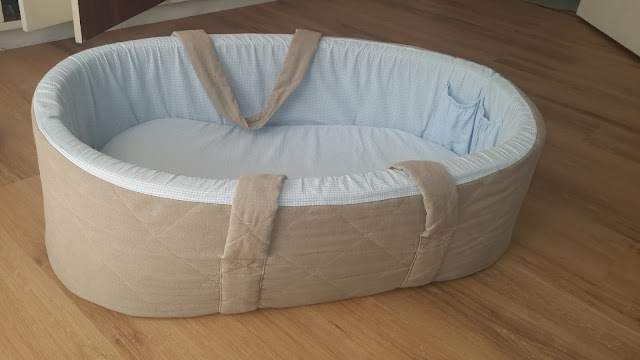 It can also be used for propping, tummy time and sitting when baby gets a bit older. 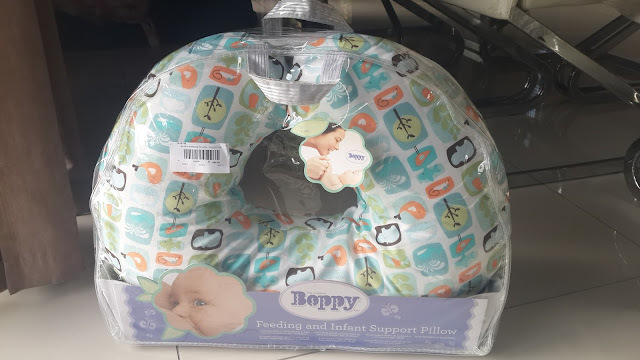 I was eyeing at Boppy brand, as it has quite good reviews. Yes, even with toys I am selective. I want toys that has a reason to be there, not just because it is a cute teddy bear. I quickly found out that this particular firefly sensory toy has been quite a hit with babies of a few months old. 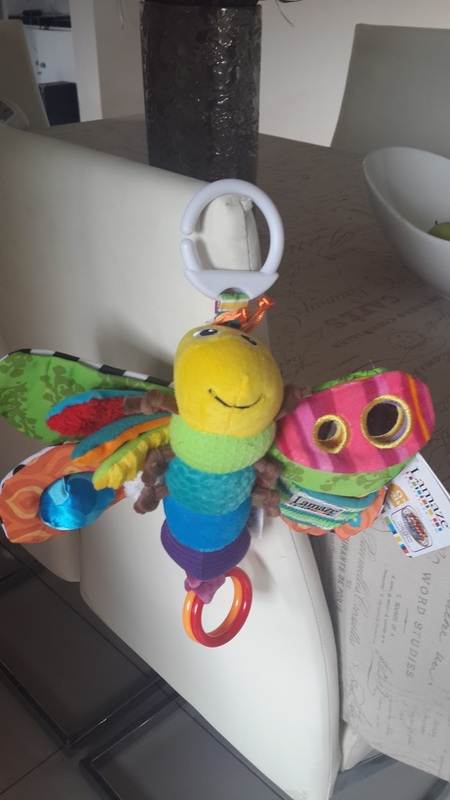 "Featuring multiple textures, colours and sounds to keep your baby captivated and entertained, this plush Lamaze Freddie the Firefly features a peek-a-boo mirror, squeaker, clinking rings, teether and crinkle features for your baby to discover. This item is also machine washable." I got it the same day I bought my Boppy Pillow, at ZAR129.99 at Babycity. Lastly, it's baby's first jersey! Me and Ian was walking around in a mall, when we saw a famous kiddy clothes shop Naartjie having a big sale. 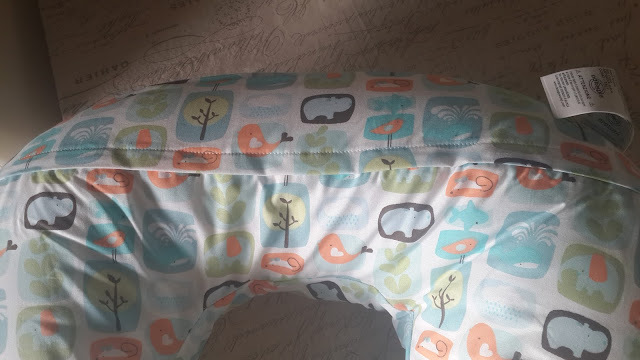 Ian saw a similar baby jersey to what he was wearing, selling for 70% off. Being an excited daddy as well, he was tempted to get it, but I reminded him that baby is going to be a summer baby, a jersey might be too warm for him to wear. At least he decided to get a 6-9 months old sized, but they don't have it in shop so it had to be ordered. When I picked it up two weeks later, the jerseys had a further 20% off the marked price. 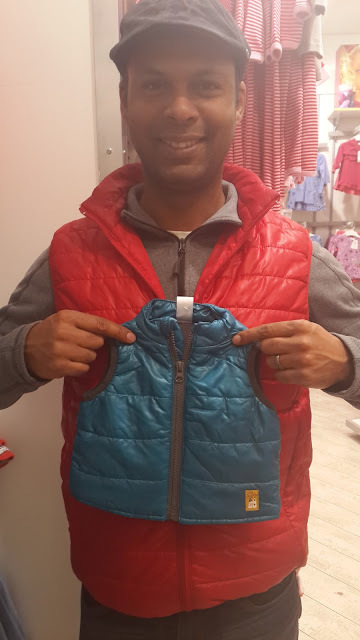 At last we bought it for around R80 something, although baby will have to wait to be able to wear it! Excited daddy cannot wait to wear this with his son! Although I have not bought much, I already know what items I want, so I am just looking out for nice second hand ones or any good deals. I am getting excited now, can't wait to meet baby! Are Antenatal Classes worth it?